Further to this harsh critique of cultural studies’ current disciplinarity and methodology by two of its most prominent advocates, the international success story of cultural studies has equally engendered insecurities regarding the intellectual and institutional location of the field. While initially closely linked to Britain and the Birmingham Centre for Contemporary Cultural Studies, cultural studies has become increasingly regionalized over the past decades. In this process, practitioners within and beyond academia have transformed cultural studies in the encounter with diverse intellectual and political traditions from across the globe, adapting a theoretically-inflected practice to the demands of regional and institutional contexts from Africa to Asia, Australia to Latin America, and across Europe and North America. But can the resultant local practices still be subsumed under the umbrella of cultural studies? What does it mean to practice cultural studies today? What relation exists between cultural studies in the tradition of the Birmingham school and the diverse practices of contemporary cultural studies in its multiple locations? The one-day workshop invited early-career researchers and established academics to discuss the status quo and possible futures of cultural studies in relation to their current work. In the evening, a public roundtable discussion will examine the current multiplicity of cultural studies approaches in a globalized academic landscape, inviting speakers to reflect on the disciplinary status of the field in ways that go beyond the current discourse of crisis. 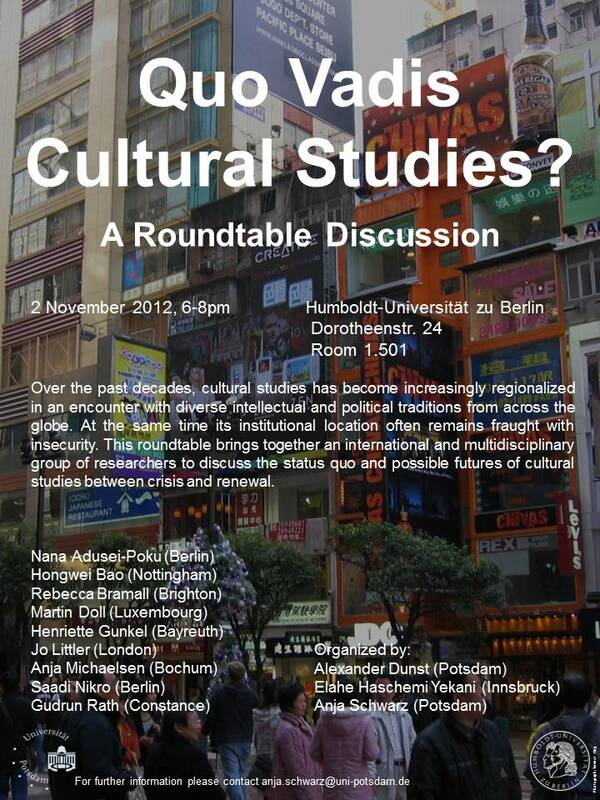 What are the methodologies that can help renew the critical import of cultural studies? How is the understanding of cultural studies as a discipline (in crisis) related to academic practices in affiliated fields such as gender, postcolonial, trans, queer and disability studies? How can we evaluate narratives of crisis, and the futurity of specific (inter-)disciplines, in the context of the corporatization of the academy? How can the intellectual traditions and methodologies of regional approaches contribute to and intervene in a cultural studies that often remains characterized by an Anglo-American bias? What potential synergies or contradictions exist between cultural studies as practiced across the Global South? How can sustained dialogue and debate between these practices contribute to the larger political project of de-colonization? What would it mean to develop a transnational, or even global, cultural studies? And what is the relation between such internationalization and the global expansion of British, American and Australian universities?